If you’ve found yourself on yourself on this page, chances are, the idea of starting your own business has crossed your mind. 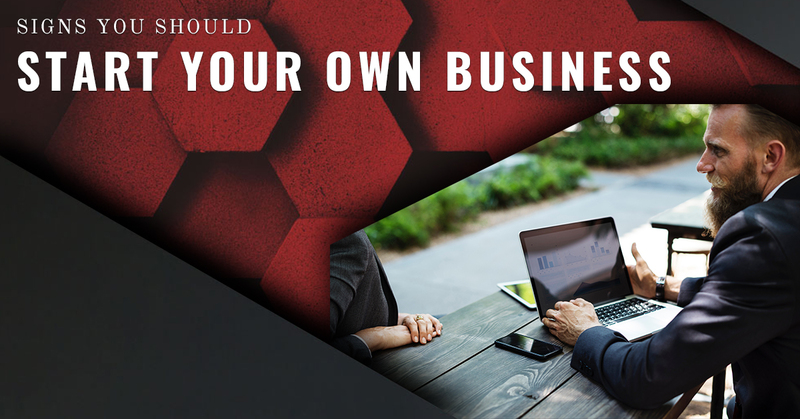 Although business ownership is by no means something that everyone will want to do in their lives, it is most definitely something that everyone is capable of with enough determination and after developing the necessary skills. Some of us may show no sign of having these skills but may be motivated enough to take on the challenge. And others may be waiting for signs that they’re destined to own a business someday. In this blog, we’re going to talk about exactly that—common signs that you should start your own business. Leadership is probably the first quality that comes to mind when you think of a business owner. Leadership becomes important once you’ve started hiring employees and your company needs to start developing a direction and vision for itself. Even though you may be losing responsibilities as your company grows, you’ll also be gaining more responsibility to lead your company and watch over every facet to make sure it’s running as efficiently as possible. As your company adds departments, services, or products, you have to take the initiative to determine how these additions will contribute to the success of your company and not put on the responsibility on other higher-ups within the company. This is key to long-term success. It’s no surprise that risk-taking is a huge part of being a business owner, especially in the startup stage. Being an entrepreneur is all about trusting your instincts by analyzing your situation and then taking a leap of faith. It’s not blind faith though, every risk you take should have something to back it up, whether it’s statistics or your own personal experience. And taking risks doesn’t just have to do with money. Every time you hire an employee, make a contract agreement with a client, or add something new to your company, you’re taking a risk. A good entrepreneur will balance the risk and the reward of every action and make an educated decision from that.